"When you need to connect with a better deal"
A site dedicated to help consumers understand the mobile telecom business. We help you to understand mobile telecom and telecom sales methods. The mobile phone industry uses high commission structures together with incentives such as CashBack. Sales incentives and promotions are often used to purchase new phones. Mobile phone contract incentives tempt the customers to transfer between contracts. End users are often purchased out of contract but such practices can lead to disreputable customer handling. There are high commissions on mobile phone sales so you have to be aware and careful of the phone company you are dealing with. Make sure that they are well established and show evidence of their guarantees. If you are wanting "Mobile phone cashback" then you had better check out who is in business and who is going to stay in business to pay for their promises! 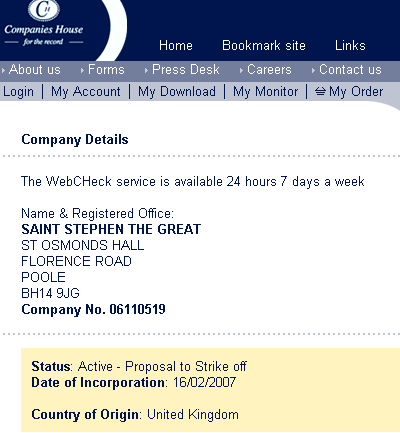 Screen shot of a Company House public record as at 19th September 2009. Such a company status may be temporary, due to late accounts, or it maybe the intent of the directors. If any telecom's supplier has a cash back arrangement with you then this will be an unsecured debt when the company ceases. What is your position when this happens? The cost of headed paper? "I just need a copy of your letter headed paper to check on your credit rating." Wow... STOP, don't do it! The next thing you will find is that the headed paper has been used by a bad and disreputable sales person for a mobile phone contract YOU did not agree to. They will fill in details on your headed paper and sign your name fraudulently. You MUST do a background check on who you are dealing with.